Our focus is on long-term success. By offering treatments which look after immediate problems as well as helping to ensure long-term health, you’ll receive a more comprehensive treatment that suits your needs. A filling today can prevent root canal therapy tomorrow. Just as good oral hygiene can prevent gum disease, and a bite guard can protect your teeth from bruxism. In a round-about sort of way even dental implants can prevent other serious oral health issues from occurring later on. Prevention is better than a cure. With regular check-ups, our friendly team can help you maintain optimum oral health. We are all about the long-term success of our patients and for us that starts with a good oral hygiene routine and regular visits to your dentist. Bringing your children to the dentist at an early age is a great way to get them acclimatised to visiting the dentist. When they visit us we ensure they have an enjoyable experience, and actually want to come back. By educating children at an early age this provides them with a great opportunity to maintain good oral health throughout their life. 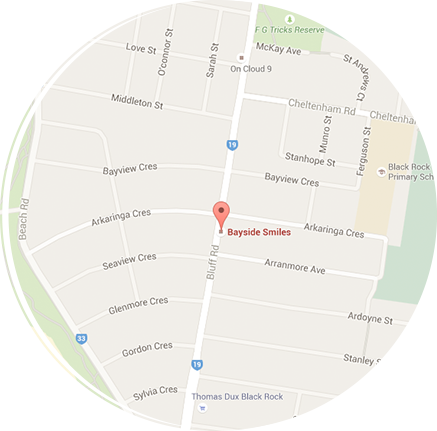 Restore the health and appearance of your smile with Bayside Smile’s range of restorative treatment. Not only do treatments like dental crowns and dental bridges restore the appearance of your smile, they also help you regain biting function. One big advantage of this is you can digest your food better. No other treatment replaces the whole tooth like dental implant treatment. The dental implant replaces the tooth root and the dental crown or bridge replaces the crown of the tooth. Bayside Smiles offer single, multiple and all-on-4 treatment. Do you wake up tired? Is your jaw sore? TMD and sleep apnoea are insidious problems which, if left undiagnosed and untreated, can go on to cause further problems for you. Bayside Smiles offer treatment plans to help relieve the symptoms of these issues. We appreciate some patients have had bad experiences with the dentist, at Bayside Smiles we offer solutions for anxious patients to help them receive the dental care they need. We have another clinic which offers the availability of 24/7 dental care all year-round to help patients receive the care they need.